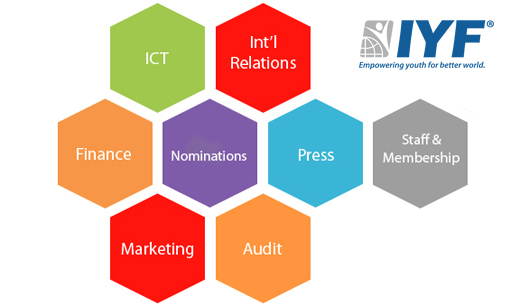 The mission of the Nominations Commission is to oversee and implement a new targeted recruitment process of IYF members. This will enable the IYF Congress to be composed of Members with different sets of skills and knowledge while ensuring the necessary balance in terms of gender and geography. Also Nominations Commission is responsible of regular elections process, and makes recommendations to the IYF Executive Board, and IYF Board of Trustees, as appropriate, on the composition of the IYF Commissions. Press Commission works to Ensuring that the Youth values and activities, as well as the IYF’s vision and mission, are promoted to a global audience though the media channels. Press Commissions hold the responsibility of press coverage of IYF activities and events. The Marketing Commission advises the IYF Administration through giving guidance, perspective and marketing recommendations which will assist the federation to continue to support the operational functions of the youth movement. International Relations Commission works to propose, liaise, formulate partnerships agreements and oversee IYF relations with partners, governments and related organization toward facilitating IYF activities and achieving the mutual interests. The Finance Committee role is to oversee all the financial affairs for IYF. It is role also to provide advice and guidance to IYF Administration and other commissions on financial matters, Ensure that the IYF and all its subsidiaries have an efficient and transparent budgeting and financial control process, and that the Financial Policies and Procedures approved by the IYF Executive Board are respected. Audit committee is in charge of overseeing financial reporting and disclosure. The audit committee's role also includes the monitoring of accounting policies, external auditors, regulatory compliance, and they advise the IYF Administration on risk management policies. The Department of Staff & Membership (DSM) works to ensure that the federation meets its mission and is operated effectively, and to assist the Administration in overseeing the performance of IYF staff and members activities. Information & Communication Technology Support Unit (ICT) works to ensuring the availability of ICT services within the IYF staff and operations. Also ICT is responsible of providing the infrastructure for information, and provide assistance in providing the operational units with the IT functions they need.